CO 8 sts over 4 ndls; place marker (if desired) and join to begin working in the round, being careful not to twist. Increase round: Inc. in every st (16 sts). Repeat last 4 rounds twice more (16 sts on each ndl for a total of 64 sts). Decrease round: K2tog to end (32 sts). Use some polyfill (or whatever) to stuff the covers. When sewing in the ends, take this opportunity to “gather” the cover a little bit over the ear pads so that they stay on. 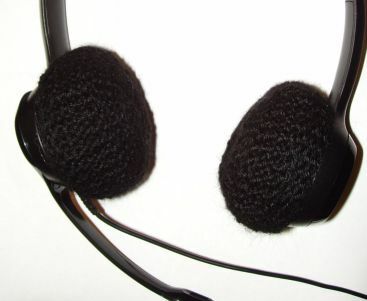 Thank you for headset ear cover pattern! Exactly what I was looking for. Glad it’s of use Alice! Thank you so so much for publishing this pattern! It worked perfectly to make earpiece covers for my wireless headset, and now my ears are pain free! I’m happy it’s working for you Kate! Do you have this in a loom pattern by chance? No, I’m sorry. I only do knitting patterns. I do loom knitting and I was hoping to convert from needles to a loom knitting pattern. Thanks anyway.